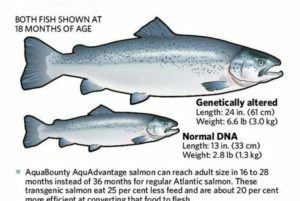 The Canadian government is receiving 10% royalties from sales of the world’s first genetically modified (GM or genetically engineered) animal, a GM Atlantic salmon. “We’re concerned that the government is responsible for regulating this GM fish and also has a stake in its success,” said Lucy Sharratt of the Canadian Biotechnology Action Network (CBAN). The royalties are part of a 2009 $2.8 million-dollar grant agreement between the company AquaBounty and the federal government Atlantic Canada Opportunities Agency. The royalties will be paid to the Government of Canada until the grant amount is paid back. If the GM salmon is not a commercial success, there is no requirement for the company to repay the government funds.